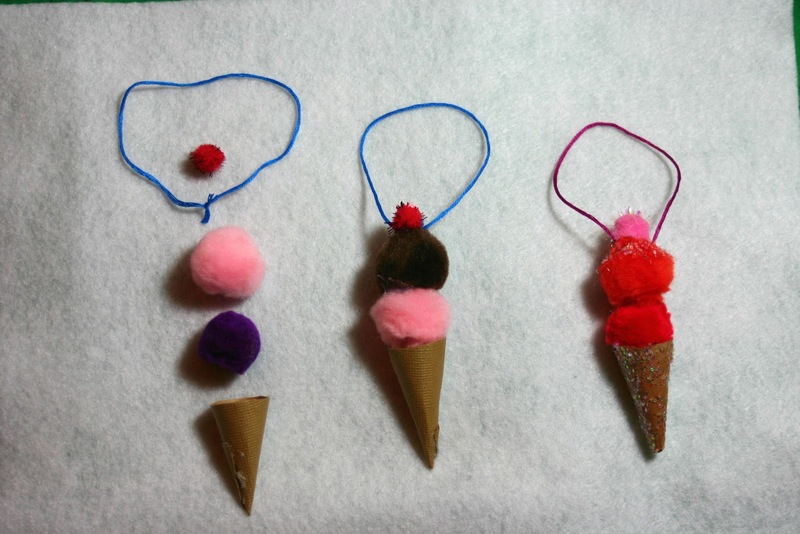 I wanted to make a felt ice cream ornament (below), but they ended out being sort of complicated and difficult to replicate. Quick tutorial: Make a cardboard cone and glue brown felt around it with a hot glue gun. 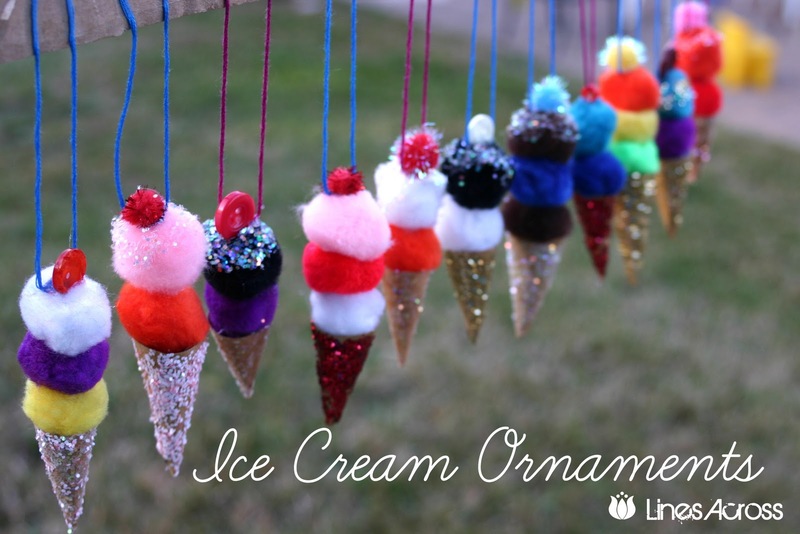 Make a couple ice cream balls with felt covering fluff. Then glue everything together, add some tiny pom pom sprinkles, and a larger red pom pom cherry. 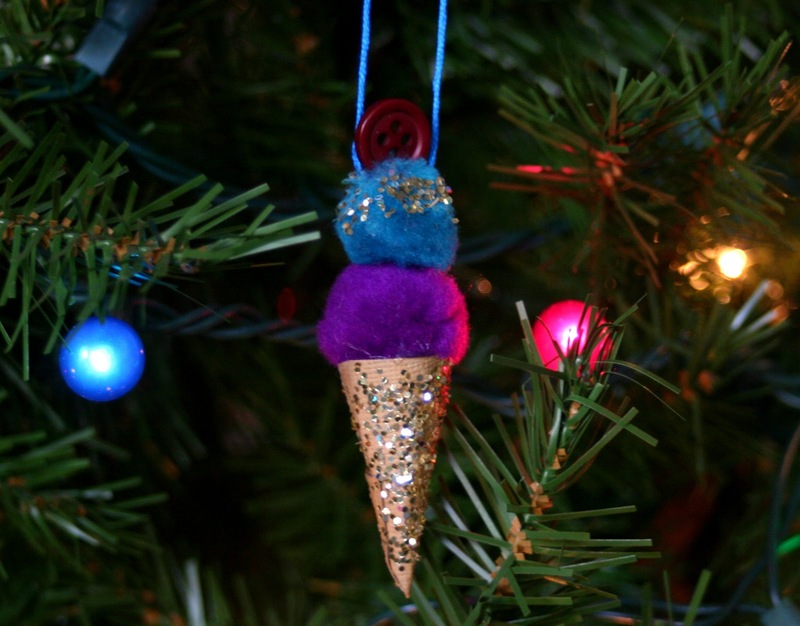 Attach a black or brown piece of pipe cleaner as an ornament hanger/cherry stem. While I was making this felt ice cream cone (which turned out cute but also resulted in quite a few hot glue burns and a surprising amount of frustration), I came up with the idea for these much simpler pom pom ice cream cones. They are ridiculously fun to make and very addicting. These little ornaments are really very easy to do. I love using a hot glue gun, but you could use any glue and just wait longer for it to dry. 1. Make a lot of little brown cones. 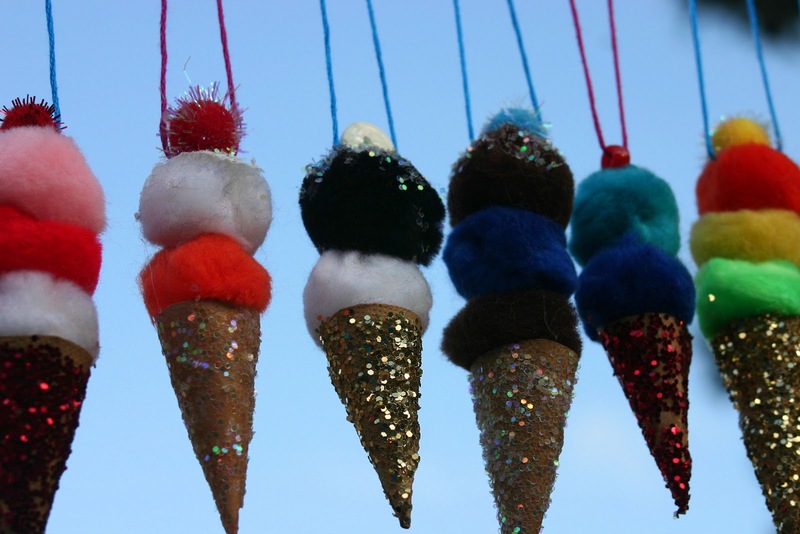 I found that it works best when the cones are narrower than the pom poms. 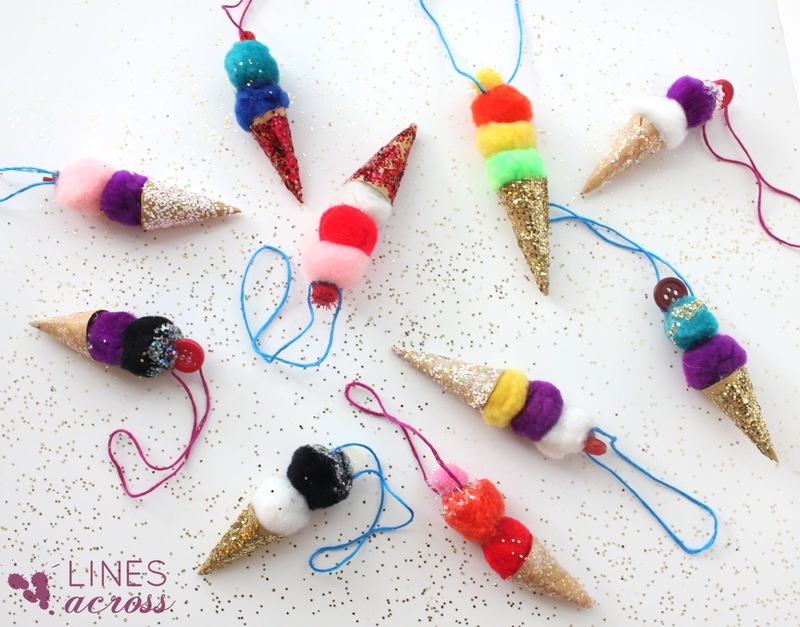 (To make the cones, cut out a lot of rectangles, twist them into cones, glue with a hot glue gun and hold until they are dry, and then trim the tops of the cones with scissors). 2. 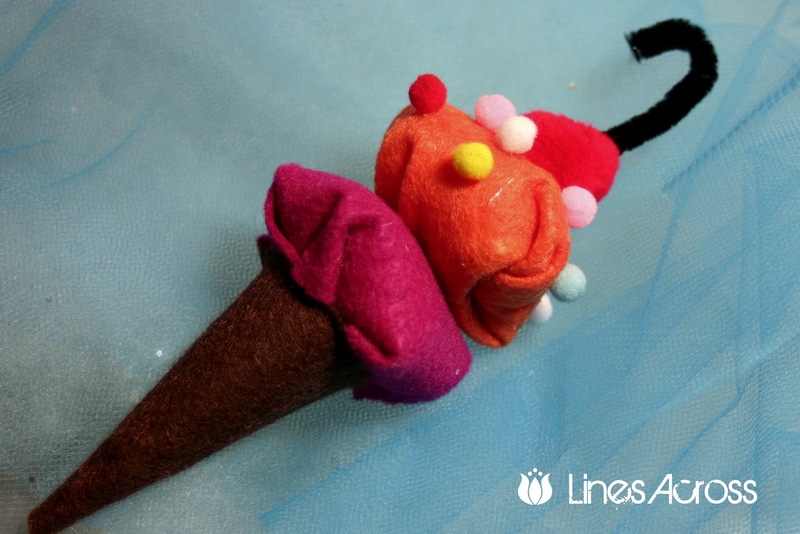 Glue together the cone, 2 or 3 pom poms, a tied embroidery thread loop, and a smaller pom pom, button, or bead. 3. 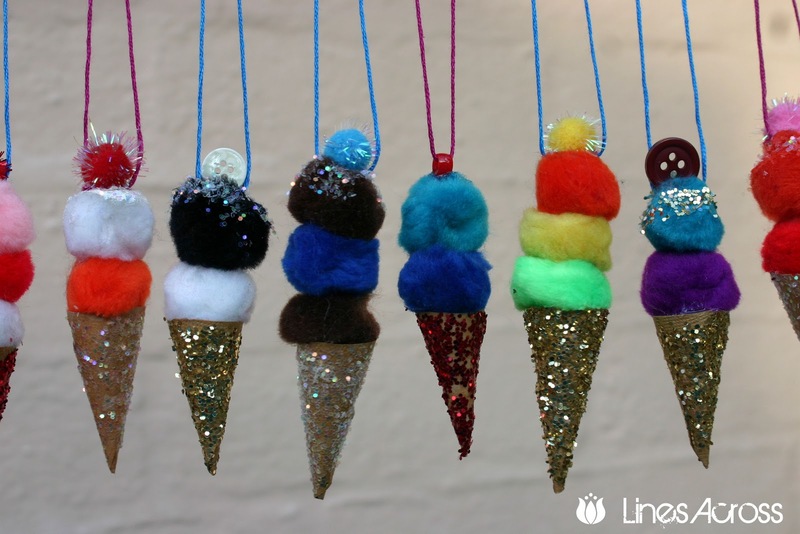 Decorate the cone and/or pom poms with glitter. Stopping by from TT & J! How adorable! I'm pinning this to try! I pinned this! Might even blog about it! Thanks for the cuteness! Would it be possible to purchase a pink one from you?